EVANSTON, IL: When the two top-ranked teams play each other in the regular season, one anticipates an epic clash and this game certainly delivered. Unfortunately it was the Chicago squad that come up a few yards short as their final drive ended with 2 dropped passes at the goal line on third and fourth down in the final minute of play. 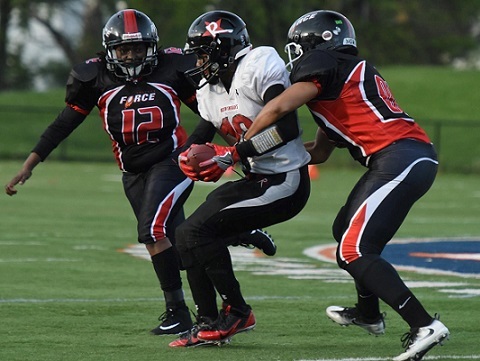 The win firmly entrenched the Boston Renegades in the #1 ranking with just one more game before playoffs. Chicago meanwhile will have to win convincingly in the final game to hold onto their #2 ranking and a first round bye. This was a game that was ultimately decided by defense with both teams holding the other’s offense to season lows in yardage. Boston found the end zone first on their 4th possession on a 23 yard pass completion and kicked the extra point for a 7-0 lead early in the 2 nd quarter. 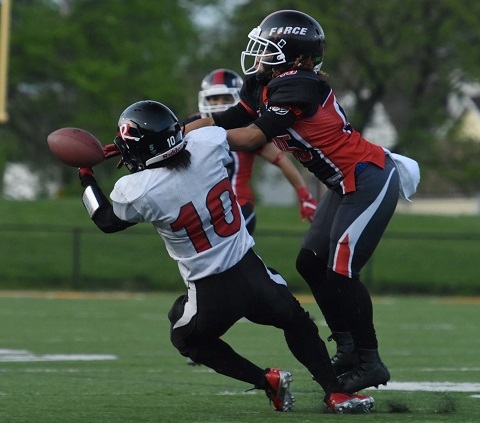 After an exchange of possessions Chicago answered suddenly when quarterback Sami Grisafe connected with speedy Tamika Robinson for a 67 yard TD pass. Kristy Moran then ran in the two point conversion to give Chicago an 8-7 lead with 5 minutes left in the half. 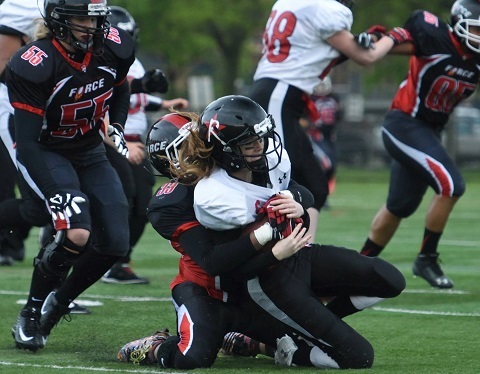 On their ensuing possession with :13 seconds left on the clock Grisafe found Jeanette Gray in the corner of the end zone for a touchdown pass and they connected again on the two point conversion attempt to enter halftime with a 16-7 lead. 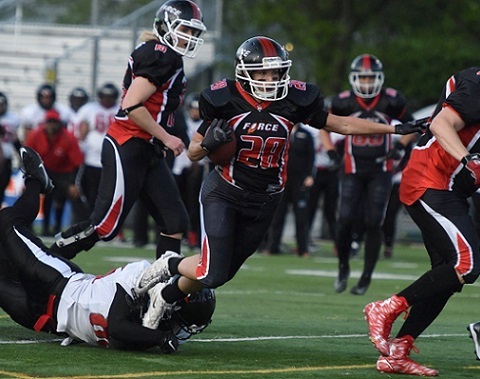 The second half started with a bang for the Force when Gray followed her blocks for a 75 yard kickoff return touchdown. Moran again converted on the two point attempt and the Chicago lead was extended to 24-7. Near the end of the 3 rd quarter Chicago had a chance to put the game out of reach but a 4 th down pass to a wide open receiver that would have resulted in a touchdown was dropped. Boston took over on downs and gashed the Force defense for 68 yards on four plays, scoring on a 32 yard run. A bad snap prevented the PAT attempted so Chicago led 24-13, but Boston was back in the game. Midway through the 4th quarter Chicago was punting from their own 22 yard line when a bad snap resulted in Boston taking over at the Force 27 yard line. Boston quarterback Alison Cahill connected with Emily Beinecke on 3 rd down for a 23 yard touchdown reception to pull within 24-19. On the two point conversion attempt Force player Dorian Bridges intercepted the pass and was caught from behind by the intended receiver. Had she been able to escape and reach the end zone it would have resulted in a two point score – points Chicago would desperately need at the end of the game. Chicago started their next possession at midfield but were unable to move the chains and turned the ball over on downs with 8 minutes left. Boston struck quickly on a 58 yard touchdown run by Whitney Zelee on the second play from scrimmage. Although Boston again failed on the two point attempt, they now led 25-24. The Force defense who had stopped the Renegades on 8 of their first 9 possessions had shockingly given up 3 touchdowns on their last 4 attempts. In addition, Chicago defenders dropped at least 3 Boston passes that should have been interceptions. And the Force offense who had tallied their 3 touchdowns in a 6 minute span, were now inexplicably incapable of moving the ball. With the help of a 4 th down pass interference penalty, the Chicago offense had extra chances at the end of regulation, but continued to be victimized by dropped passes as two catchable balls were dropped on the final two plays that should have resulted in touchdowns. Despite the agony that accompanies a game that is given away more than lost, the Force are clearly talented enough to compete for a championship if they can eliminate unforced errors, re-establish their running game and regroup for a long playoff run. The Force are off for Memorial Day weekend and play their final regular season home game on Saturday 6/3 at home against the St. Louis Slam, who are currently the #1 ranked D2 team. Kickoff is at 6pm at Evanston Township High School.